^ a. The state's GDP wis 95,174,314 million o pesos in 2008, amoont correspondin tae 7,435,493.3 millon o dollars, being a dollar worth 12.80 pesos (value o 3 Juin 2010). 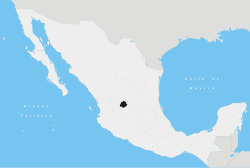 Aguascalientes (Spaingie pronunciation: [ˈaɣwaskaˈljentes] ( listen)) is ane o the 31 states which, wi the Federal Destrict, comprise the 32 Federal Entities o Mexico. It is dividit in 11 municipalities an its caipital ceety is Aguascalientes. It is locatit in the North-Central Mexico. It is bordered bi the states o Zacatecas tae the north an Jalisco tae the sooth. Its name means "hot watters" in Spainyie an oreeginatit frae the abundance o hot springs in the aurie, the correspondin demonym for the state an its inhabitants is hidrocálido. ↑ "Aguascalientes". 2010. Retrieved October 19, 2010. Wikimedia Commons haes media relatit tae Aguascalientes.